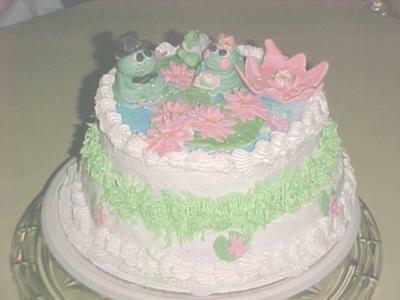 To make this Mr. Frogs Wedding Cake, I baked a ten inch white cake mix a whole mix in the one pan. Next, I trimmed it flat. I baked two six inch strawberry cakes for the top, but I used one only. I froze the other half for later cakes. I made my water lily pads and flowers and frogs and turtle with fondant. I let it dry over night. Then, I frosted the cakes with white butter cream and used it for the filling also. I used a wilton can of blue frosting spray for the top of the cake for water. I used a grass tip for the grass around the cake and large shell tip for borders. I am not to good in shaping animals but it was fun trying.